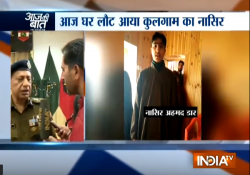 In the past few days, two militants in Kashmir valley have returned home, while parents of several other militants have issued appeals to their sons to come back. Some of the appeals that I have seen on video are really touching. One feels sorry for the parents, sisters and wives of these youths who have taken up the gun and vanished. A mother or a father can understand the pain when their son leaves them suddenly in old age to join militancy. In Jammu and Kashmir, any militant who wishes to come back can ring up this phone number: 14411. Our security forces will help them in returning home. I am proud that India TV was the first news channel which showed to the world the cry and pain of Majid’s mother. After her emotional appeal, Majid came back to his family. I hope the appeals of these parents will not go waste and their sons will surely return to a peaceful life.